Bernie Sanders should call on her to repudiate him as the war criminal he is. Kissinger’s crimes aren’t just related to covert murder, genocide, and illegal bombing. In 1975, for example, as Gerald Ford’s secretary of state, he helped Union Carbide set up its chemical plant in Bhopal, India, working with the Indian government and helping secure a loan from the Export-Import Bank of the United States to cover a portion of the plant’s construction. Then, after the plant’s 1984 chemical-leak disaster, Kissinger Associates, the consultancy firm he set up after leaving the State Department, represented Union Carbide, helping to broker, in 1989, a $470 million out-of-court settlement for victims of the spill. The payout was widely condemned as paltry in relation to the scale of the disaster: The spill caused nearly 4,000 immediate deaths and exposed another half a million people to toxic gases. Kissinger Associates is a private company—Kissinger famously quit as chair of the 9/11 Commission so he wouldn’t have to reveal his client list—so the fees it extracted from Union Carbide for this service is unknown. But Bhopal is a good example of the way Kissinger, as a private consultant, profited from the work he did as a public servant (for Kissinger’s role in negotiating the settlement, see the 1988 letter obtained by the environmental reporter Rob Edwards, found here; also, see New York Times reports that Kissinger’s firm had an account with Union Carbide). Kissinger’s role in helping to create today’s immiserating global economy and structural inequality didn’t start with NAFTA. As Gerald Ford’s secretary of state, Kissinger was key to making sure Saudi Arabia’s and, until its revolution, Iran’s growing mountain of petrodollars were recycled through private banks and arms merchants in Germany, the United Kingdom and the United States—undercutting Third World demands that capital be used to fund a more equitable global economy, what was then called a New International Economic Order. Likewise, in Latin America and Eastern Europe, Kissinger Associates profited from what one of its consultants called the “massive sale” of public utilities and industries, a sell-off that, in many countries, was initiated by Kissinger-supported dictators and military regimes (Kissinger’s fudging of the line between public policy and private finance, especially as it relates to the arms trade and petroleum extraction, echoes through many of the controversies of the Clinton Foundation; see David Sirota and Andrew Perez’s reporting, especially “Clinton Foundation Donors Got Weapons Deals from Hillary Clinton’s State Department” and “As Colombian Money Flowed to Clintons, State Department Took No Action to Prevent Labor Violations”). This sell-off was part of the global transformation to what is commonly called “neoliberalism,” and what in this campaign season has come to be known as Clintonism, as opposed to Sanders’s vision of a restored New Deal: the privatization of the world’s political economy and, in the name of “free trade,” its transformation into a series of speculative bubbles, cyanide-spewing open-pit mines, and toxic spills. 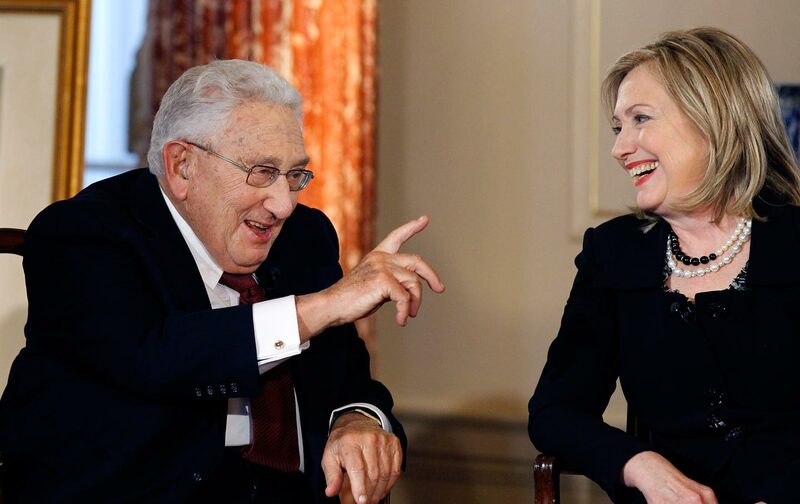 Keep an eye out for Kissinger’s response to Hillary Clinton’s overture, for over the long course of his public life he’s served as a good bellwether. With every right-wing lurch of the foreign-policy establishment, Kissinger lurched with it: supporting Richard Nixon, Ronald Reagan, and George W. Bush. It is to this list that Clinton now asks to be added. Sanders shouldn’t wait for Kissinger’s answer. He should use the Politico story to proactively repudiate, as he did during the primary debates, Kissingerism, and demand that the Clinton campaign stop sniffing around for Kissinger’s nod. The point of such a move wouldn’t be to hold Kissinger responsible for all that is wrong with US foreign and economic policy. There are many fingerprints, not just Kissinger’s, on America’s imperial crimes, and Clinton has the backing of a large number of bipartisan war criminals and the intellectual authors of a good portion of the world’s misery. Rather, making Kissinger a deal-breaker would recommit the Sanders movement to its original promise (unfortunately more often implied than explicitly stated in Sanders’s primary criticism of Clinton) of breaking this vicious cycle between war and “free trade,” helping to clarify how the mutually dependent relationship between militarism and neoliberalism was institutionalized during Bill Clinton’s presidency and affirmed during Hillary Clinton’s tenure as secretary of state.